Lapis brings the best when collecting data for your project. Whether you’re an architect, landscape architect, urban designer or civil engineer you know how time consuming it is to retrieve necessary data for your work. Lapis will do this job within seconds. So valuable time will be saved to do things that really matters. After having set your parameters Lapis will collect geographic data from several servers for your selected area with just one button click. The collected geographical information, aerial imagery and elevation data will be used as layers that can be positioned as a basis for your project. This allows you to create a virtual 3D environment of the area within minutes. Grabs Aerial ortho rectified images from WMS providers in high quality or low quality for quick review. 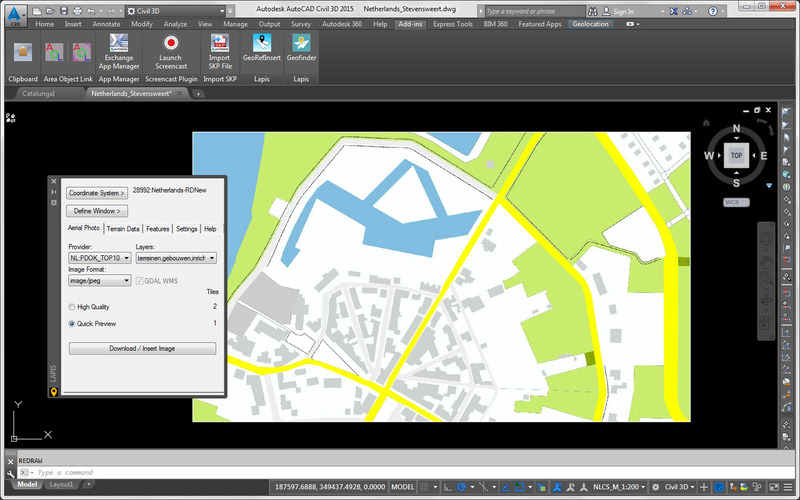 Creates a georeferenced image with corresponding World File and inserts the image into AutoCAD. Creates a GDAL WMS XML file which can be used to built a Raster (Aerial) directly from the online data source into Autodesk InfraWorks. Grabs in a similar way also other WMS based maps, like topographical maps. Already available WMS providers per country can be found below this page. Grabs Terrain Data from WCS providers in a given window (polygonal area soon available). Creates a georeferenced dem (tiff) file. Creates a WCS GDAL XML file which can be used to built a Raster (Terrain) directly from the online data source into Autodesk InfraWorks. Creates a TIN Surface as an option when used with AutoCAD Civil 3D. Closes holes in terrain from data source. Grabs and download GIS vector based features from WFS providers. Inserts the features into the drawing when used in AutoCAD Map 3D or AutoCAD Civil 3D. Ease your work and save valuable time. Let Lapis do the job. Yes, we ask a one-time fee of US$99 but the amount is worth the money. If you buy it before the AutoCAD 2016 products release, you get the upgrade for free. Now available at Autodesk Exchange | Apps. Lapis is named after ‘Kueh Lapis’. A steamed multi layered Javanese treat with a jelly feel that tastes quite sweet. Providing desired data layers but with the least effort. Watch below video instructions and see for yourself what Lapis is capable of..
Or download a full working 30 days Trial at Autodesk Exhange Apps | Store. Also take a look at my free GeoRefInsert app add-in. With this app you can insert geo-referenced aerial ortho images from your local network or hard drive into any AutoCAD* (Windows based) full version. You can download it here. After installing Lapis Geofinder on your system, you can start the application in AutoCAD* from the add-ins or plug-ins panel of the ribbon menu by clicking the Lapis Geofinder icon. Make sure to have your drawing setup with the right coordinate system. Click the Download/Insert button and you’re are on the go. In case your question isn’t answered in the topics below please leave a message. Hotfix for Surface creation in AutoCAD Civil 3D 2016. Imported imagery will be send to back (draworder) automatically. Hotfix for big imagery TIFF file size creation. Now 15% of previous file size. Support for 2016 versions of AutoCAD. Support for non-English versions of AutoCAD. Fixed some FILEDIA variabele issues. If you have downloaded Lapis or the trial, you will be automatically notified on updates. What is the quality of the image I retrieve from the web service server? The quality of the image is based on the ground resolution expressed in cm/inches per pixel of how the data is collected by the web service provider supplier or data collector company. What is the difference between the high quality and Quick Preview options? The High Quality ensures you get the highest quality according to the provided ground resolution. The result may vary because of possible overlap at the time data is collected. The Quick Preview is a low resolution quality without using the ground resolution of the collected data. Using the High Quality the resulting image is built by multiple tiles calculated on the selected area and ground resolution. Can I use my own known web service server provider with Lapis? Yes, you can. You can add your WMS server of choice in the suplied WMS.ini files. Where can I find the WMS.ini file? You can find the WMS.ini file in your My Documents\Lapis folder. Or else you can find a similar WMS.ini file in the C:\ProgramData\Draftworx\Lapis folder. I have an url for retrieving maps from a WMS server. How do I set it up in the WMS.ini file? The clipped image is not at the right position of where I picked the corners of the selected area. What am I doing wrong? Your drawing should be set up in the same EPSG code projected coordinate system as the web Map Service EPSG code you select from the WMS provider. You can check the EPSG code when you select your WMS provider from the list. Which data file formats does Lapis support for retrieving terrain elevation data? Lapis supports almost all the file formats the web coverage service (WCS) supports as well. If you have a format which is supported by your WCS provider and not by Lapis, please contact support@lapis.solutions. My downloaded terrain TIF data contains holes in it. How can I fix that? If you have AutoCAD Civil 3D, use the option “Create Surface” in Lapis. Then you need to export the surface as DEM using the command “Surface to DEM”. My provider only supports file downloads. Does Lapis supports this type of files too? No, at the moment Lapis only supports web services, and for terrain elevation data that is the WCS protocol. No, at the moment Lapis only supports web services, and for terrain elevation data that is the WFS protocol. I have a WMS url from an Aerial Ortho Imagery provider, where can I add it to the Lapis Geofinder app? Go to the My Documents\Lapis folder and open the WMS.ini file with Notepad or any text editor. What information from the WMS URL do I need to add to the WMS.ini file so Lapis will use these in the app? The WMS.ini file is split up into sections for each WMS provider. Each section consists of 9 text rules. The setup for an entry in this WMS ini file is explained in the Help files. I have a WMS url from an Aerial Ortho Imagery provider, but I cannot get it to work with Lapis, can I ask for help? Yes, you can. Send your WMS URL of your provider to support@lapis.solutions and we’ll contact you within 2 ‐ 3 business days. This service is for free. I have a WCS url from an Terrain elevation Data provider, where can I add it to the Lapis Geofinder app? Go to the My Documents\Lapis folder and open the WCS.ini file with Notepad or any text editor. What information from the WCS URL do I need to add to the WCS.ini file so Lapis will use these in the app? The WCS.ini file is split up into sections for each WCS provider. Each section consists of 9 text rules. The setup for an entry in this WCS ini file is explained in the Help files. I have a WCS url from an Terrain elevation Data provider, but I cannot get it to work with Lapis, can I ask for help? Yes, you can. Send your WCS URL of your provider to support@lapis.solutions and we’ll contact you within 2 ‐ 3 business days. This service is for free. I have a WFS url from a GIS data provider, where can I add it to the Lapis Geofinder app? Go to the My Documents\Lapis folder and open the WFS.ini file with Notepad or any text editor. I have a WFS url from a GIS data provider, but I cannot get it to work with Lapis, can I ask for help? Yes, you can. Send your WFS URL of your provider to support@lapis.solutions and we’ll contact you within 2 ‐ 3 business days. This service is for free. What type of licenses do you supply? There is a locked license which is locked to the user’s system.Soon a named license will be will be offered through the use of an Autodesk ID. I will soon receive a new computer. Can I transfer my license to the new computer? Yes, you can transfer a locked license from one computer to another. Once the license is transferred, the application can not be used once it is restarted. I have paid Lapis thru the Autodesk Exchange Apps Store, but Lapis starts with a 14 days trial. How can I activate Lapis? As soon as you’ve paid Lapis from the Autodesk Exchange Apps Store you will receive within 2 – 3 business days a serial key to use for activation. With this serial key you can activate Lapis online directly or via e-mail with a response of 2 – 3 business days. You have purchased Lapis Geofinder from the Autodesk Exchange Apps store, and want to like to know how the license activation ill be processed.? Within 2 – 3 business days you will receive a license key in your e-mailbox. Apply this license key with the activation screen of the add-in/plug-in application. Choose Online activation or Activation by email. Online activation will almost take place immediately. While activation by email will take an extra step to take. You can buy our product through the Autodesk Exchange Apps Store. Payment can be done via Paypal, iDeal, Credit Card or other world wide accepted payment methods. Lapis comes with a set of WMS available servers. In this list you will find the most recent WMS urls for maps per country. If you know any available free, open or even paid WMS based service, please share it with us and we will add this to the list. Download the WMS ini file (in zip format) of your country. Extract the WMS ini file and overwrite it to the default folder location of the ini files. The My Documents\Lapis folder is the default location. Restart AutoCAD or click Reset to Default in the Settings tab of Lapis Geofinder tab. If you have to use login account credentials to access your WMS server, please add them in the WMS.ini file. * access requires registration and authentication. Lapis comes with a set of WCS available servers. In this list you will find the most recent WCS urls for maps per country. If you know any available free, open or even paid WCS based service, please share it with us and we will add this to the list. Download the WCS ini file (in zip format) of your country. Extract the WCS ini file and overwrite it to the default folder location of the ini files. The My Documents\Lapis folder is the default location. If you have to use login account credentials to access your WCS server, please add them in the WCS.ini file.